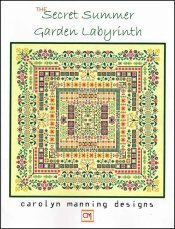 Garden Labyrinth: Secret Summer [J1581] - $15.00 : Yarn Tree, Your wholesale source for cross stitch supplies. Cross stitch pattern by Carolyn Manning Designs. It's summer at this garden! The bees are buzzing, the flowers flowers are blooming & the butterflies are flying. Look closely & you will find a few ladybugs as well. Enjoy working on this design for summer. Stitch count 219w x 219h.